Oyster mushrooms or hira-take in Japanese are sold as Shijime in local groceries stores in Japan. Hiratake mushrooms are often found used in stir fry dishes as well as soups like oyster mushroom soup. The calories in Oyster Mushrooms per 92g(1pack) is 18 calories. 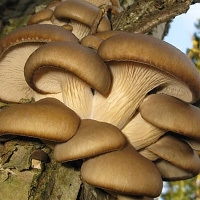 Oyster Mushrooms is calculated to be 20Cal per 100 grams making 80Cal equivalent to 400g with 5.7g of mostly carbohydrates、3.04g of protein、0.28g of fat in 92g while being rich in vitamins and minerals such as Niacin and Pantothenic Acid.